The WEGAS team has been very excited over the last few days that their work, and polar science in general, has garnered so much interest in the global media. The reason for this of course was the serendipitous discovery of a puzzling ring structure on the Roi Baudouin ice shelf, and its interpretation as a possible meteorite impact crater. After first appearing as a simple note about the ongoing AWI expedition in this blog, the story really built up momentum thanks to the team’s interviews with Belgian journalists from the International Polar Foundation based at Princess Elisabeth Station and in Brussels. The team is very grateful to the Foundation and its journalists for their part in this cooperation. Whilst the team has continued to concentrate on its research into the development and demise of the supercontinent Gondwana by flying more missions with Polar 6, the scientific method has been working in rather different ways on the puzzle of the ring structure. The impact theory spread rapidly in the media and internet. The public imagination was ignited – perhaps in resonance with the classic movie, “The Thing” or others – and discussions started on social media, for example Reddit and Twitter, that examined the structure and its social and scientific implications in some detail. 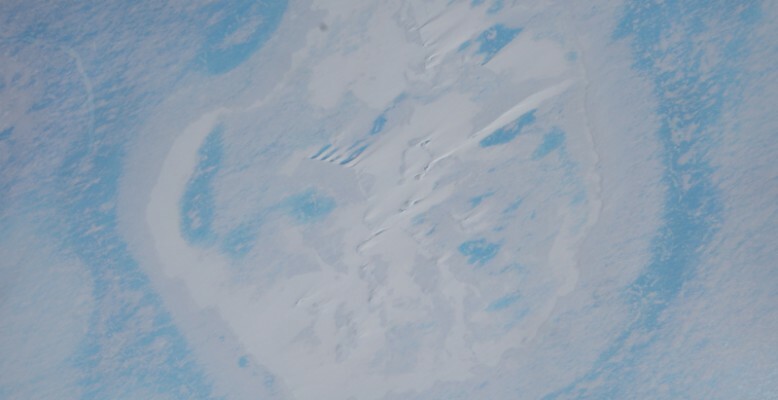 In one of the very first interviews the team already stated that other ice-shelf processes might be responsible for the observed structure, too. More so, as there were at that time some indications that the ring structure might have persisted for longer. Meanwhile, a group of glaciologists started discussing alternative explanations for the structure. Whilst the fact of this discussion did not surprise the WEGAS team, the forum did, because this glaciological research meeting happened entirely on Facebook. In particular, Doug MacAyeal, a glaciologist from the University of Chicago, put forward the suggestion that the ring structure could be an ice doline. Here, however, we would in particular like to thank glaciologist Jan Lenaerts of the University of Utrecht, who brought the discussion to our attention. In doing so, he took the study of the ring structure forwards by several weeks. Like the WEGAS team at first did, you might at this point be asking yourself what in the world an ice doline is. The answer is a kind of crater that is not as widely known or thought about as meteorite craters. They form when cavities in glaciers or ice sheets cave in, in much the same way as sinkholes can form over caves in limestone areas. In glaciers, the cavities form much more rapidly than limestone caves, by the drainage of meltwater from so-called englacial lakes or water pockets. Ice dolines have been known since the 1930s from observations of ice craters in Greenland and the Antarctic Peninsula, where the ice melts in summertime in larger quantities. With this long but somewhat forgotten history, ice dolines are described in enough detail for our Boxing Day flight data to be able to thoroughly test the hypothesis that the Roi Baudouin ring might indeed be a crater formed by the drainage of water from inside the ice shelf. Just as was the case with the impact crater hypothesis, new questions and observations are starting to be considered for the ice doline hypothesis. 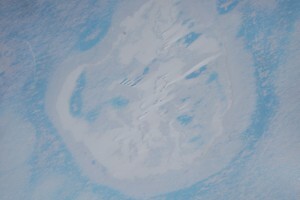 Using satellite images like these ones on Google Maps and Google Earth, the WEGAS team had already noted in some of its media interviews that the roughly 3 km wide ring has been present on the ice shelf since the 1990s, and is accompanied by similar but smaller rings. Allen Pope’s tweet shows how the main ring has migrated along with the shelf in this time. Our glaciological colleagues in Bremerhaven and elsewhere however are already thinking about the considerable reservoir of melt water that an ice doline of this size implies to have existed. Above all, they ask, if ice dolines are commoner in East Antarctica than thought until now, what might the melting they represent mean for understanding the climate there, so far away from the rapidly warming parts of West Antarctica and the Antarctic Peninsula where ice dolines first came to attention? For the WEGAS team, however, our experience of the last few days has shown that modern scientific discussion is not confined to the ivory towers of learned meetings, technical papers, and lecture halls, but that the public and social media play a tremendous role. For us, cut off from the modern world amongst the eternal ice, this new science seems to have happened at an almost breathtaking pace. Despite this, we are relieved to see that this new way of working takes us just as reliably towards an answer to the question that in the first case was so unexpectedly asked of us: just how did this ring get here? So what next? First, all of the field data need to be gathered together for thorough study. The flight data amount to several terabytes, which can’t simply be sent to AWI by satellite transfer. Instead, the data will travel on hard disks with the WEGAS team to Germany, arriving in early February. Only then can the task of processing and interpreting the data begin, which we expect to last several months. If the results enable either or both hypotheses to be ruled out, then an article about the process will be prepared for peer review, publication, and further discussion amongst the interested community. It is usual that this process generates follow-up questions, which in this case might best be answered by studies based on the ice shelf. Studies like this might well be possible in collaboration, as this whole story began, with colleagues working from the Belgian Princess Elisabeth station. As part of the BENEMELT project, Jan Lenaerts wants to pay a visit to the ring structure as soon as possible. Because of longer lead times for Antarctic ground work and logistics, this will likely the earliest be possible in the next field season 2015/16. We show the mechanism of a doline on the ice shelf in a next figure.